The Spotless Starling, Sturnus unicolor is a passerine bird in the starling family Sturnidae. 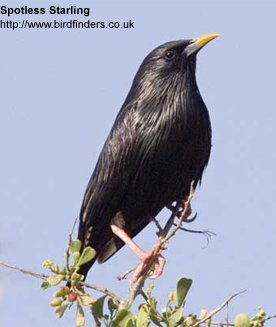 It is closely related to the ubiquitous European Starling, but has a much more restricted range. This starling is resident in the Iberian peninsula, northwest Africa, Sicily, Sardinia and Corsica. It does not migrate. This starling is catholic in its choice of habitats, and can be found in any reasonable open environment from farmland and olive groves to human habitation. Like their commoner relative, these birds are omnivores, taking invertebrates, scraps and berries. This is a gregarious species, forming sizeable flocks in winter, although not of the enormous size of European Starling. This is a hole-nesting species, breeding in tree holes, buildings and in cliff crevices. It typically lays four eggs. Confusion with other species is only likely in winter, when migrant European Starlings may also be present. This species has darker, oily-looking plumage, which is entirely spotless in spring and summer. Its legs are bright pink. Young birds are dull brown, and darker than European. Like their relative, these starlings walk rather than hop, and have a strong direct flight, looking triangular-winged and short-tailed. This is a noisy bird, and a good mimic; its calls are similar to the commoner species, but are clearer and higher pitched.